One of the more popular ways to interact with the supernatural is through divination. Divination is one of many rituals or processes where a medium attempts to gain insight into situations or questions. There are many different methods of divination like scrying, rune casting or dowsing with a pendulum. Among these various methods is dowsing with a pendulum. This is the most basic and easy to learn form of divination. 2 What is a Dowsing Pendulum? 3 How Does a Dowsing Pendulum Work? There are several definitions of what divination is. DivinationDivination is usually described as a form of practicing fortune telling. Some people do not believe in fortune telling and instead feel that we all have the power within us to shape our futures. They feel that nothing is truly set in stone until we make a decision that will shape it. To those who don’t believe in fortune telling, divination is more of a way to gain insight into situations or questions. 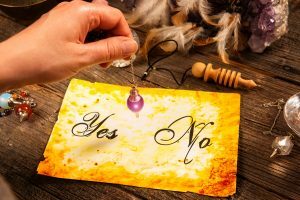 Those who don’t believe in fortune telling approach divination as a way to gain higher knowledge, guidance or mental clarity. 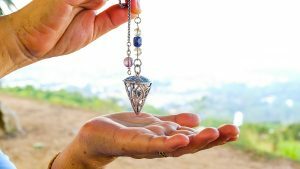 Regardless of whether you believe in traditional fortune telling or you are skeptical of its validity, the pendulum can be a powerful tool for insight into one’s self. Pendulums have been used for years as a way to gain straightforward, quick and sometimes very surprising answers to questions you may have. 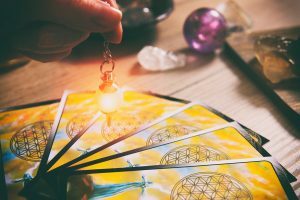 While using a dowsing pendulum can be an effective and inexpensive form of divination, there are some important things to know about using one. Before going further, it is important that you know that dowsing isn’t for everyone. It incorporates metaphysical beliefs that are not part of traditional Judeo-Christian belief systems. It’s best to make up your own mind about whether divination could be of use to you by trying it for yourself. What is a Dowsing Pendulum? A dowsing pendulumdowsing pendulum is a crystal or rock that hangs from the end of a chain or string. The traditional use of dowsing pendulums was for locating minerals, hidden water wells and any other objects that might be buried and hidden underneath the ground. Now it’s a simple way to gain spiritual insight. How Does a Dowsing Pendulum Work? Do the answers we get using a pendulum the result of spirits, magic or psychic powers? I prefer to think that the way the pendulum works is through connecting people with their unconscious mind. This is known as the Akashic Records. When a question is asked the pendulum stimulates the unconscious mind to respond. It does this by influencing nerve endings in our fingers without our conscious knowledge. This causes the pendulum to respond by the way that it swings. The body expresses the knowledge we possess internally, which we may not realize is in us. 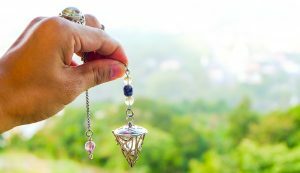 The use of a dowsing pendulum is one of the easier methods of divination, which makes it suitable for most anyone to practice with. You certainly don’t have to be a psychic to use one. The following are some useful tips to help get you started. Start by thinking about the type of crystal or material you want your pendulum to have. It might be your power stone. This is the stone that resonates the best in your life. You can go to a local metaphysical store and hold different pendulums to see how you interact with each one. Then choose the one that feels right in your hand for whatever reason that may be. If you aren’t able to visit a store where you can purchase a pendulum, you can purchase them online. Another option would be to make your own pendulum. You can do this by taking a piece of string like one from a tea bag and tying a heavy object on the end, although the object shouldn’t be so heavy that it doesn’t swing easily. Something that weighs similarly to a glass bead is perfect in this case. Once you have found a dowsing pendulum that feels right to you, you will have to clear any residual energy from it. You should cleanse your pendulum in the same manner that you would clear energy from a crystal. Run it under hot or cold water or burying it in the ground for a day. Once you feel that any energy has been cleared from the pendulum you will be able to use it. It is fairly straightforward to build a relationship with your pendulum. Remember though that like all things worth pursuing, it can require commitment and a bit of time. You will first need to learn the ‘language’ of your pendulum and get your unconscious mind in tune with it. Have a few deep breaths. This will help to both center and ground you. Ask it for support and guidance. Some people like saying a prayer to their soul (Higher Self) or their Spirit Guide to be sure that they get clear answers in the most objective way. If this doesn’t feel right you can search online for other ways that may work. Ask some questions of your pendulum. You need to do this to determine what movements mean yes, no and maybe. Your pendulum may swing clockwise, counterclockwise, from side to side or forwards and backward. To better understand what the different directions mean, you can try either of these two methods to determine which one you like more. The first way is to just tell the pendulum to show you a yes and then wait for it to move. Then you can proceed to ask it to show you a no and wait for movement. Lastly, you can ask it show you a maybe and wait to see how it responds. Once this is done you should thank your pendulum, make note of the directions before going on with asking your questions. The second way is asking the pendulum questions to establish objective responses. One example would be in order to determine the direction your pendulum will swing if the answer is yes, you could ask questions with affirmative answers like “ Am I a man/woman?” and then take note of the way the pendulum swings. Then ask questions where the answers would be no like “Are my parent’s alive?” and make note of how it responds. You must be sure to ask questions that have definitive, clear answers. Any other movements can be taken to mean maybe. Now you are ready to use your pendulum. Make sure that you are seated comfortably. To start your practice you want to be sure that your arm is in a stable position. It may help to put your elbow on the table for extra support. Take hold of your pendulum so that is loose and gently held between your index finger and thumb with enough pressure to keep it from falling. Now bring to mind a question that you desire a clear answer to. You can ask almost anything of your pendulum. The topics can vary from deciding on an outfit to wear out on a date, or the location of an object that is missing. You can use your dowsing pendulum to answer mundane, everyday questions relating to relationships and money or for more questions concerning more profound existential/spiritual matters. Some books on pendulums and websites also can provide charts that could help with determining the health of various organs of the body as well as your chakras. Don’t use your pendulum if you are feeling imbalanced emotionally or mentally. This could cause inaccurate responses. To prevent this you could ask before starting if it is a good time for you to dowse. Never use your pendulum to replace medical expertise. If you have health concerns visit a medical professional. Only dowse for yourself. Unless given permission, and even then, be wary that you aren’t skilled enough to provide answers to others. Be open-minded when it comes to using your pendulum. If your mind is already made up about something it will most likely be reflected in the dowsing. There is a limit to what pendulum dowsing can accomplish. Sometimes other forms of divination like tarot, scrying or the I Ching since they can provide multilayered answers. Don’t over-rely on your pendulum. It shouldn’t be the only way you make decisions and you should never blame your actions by claiming the pendulum told you to so that you are absolved of blame. While using a pendulum may not be for everyone, it can be an insightful way to find answers for life’s many questions. Remember to bond with your pendulum, and go into the divination process with an open mind for the best results!